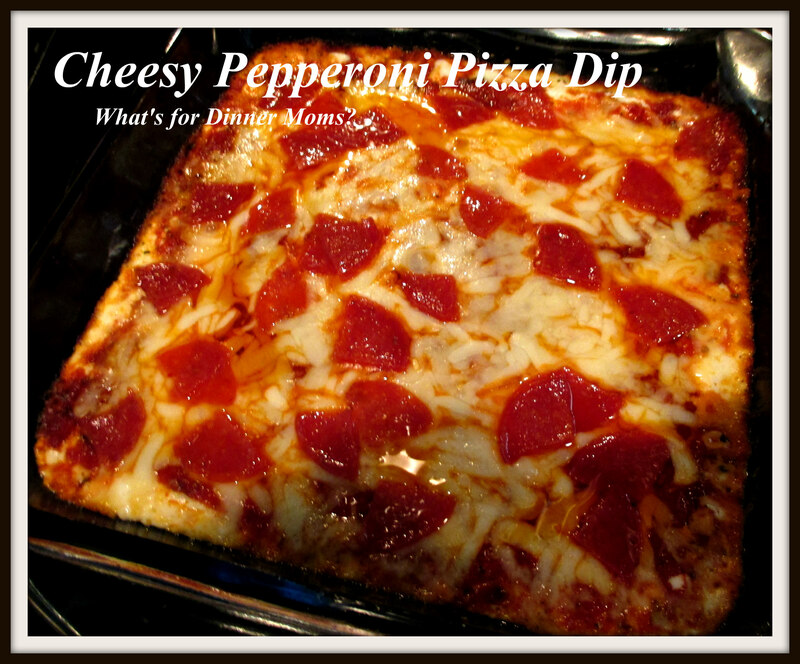 Cheesy Pizza Dip with Pepperoni – What's for Dinner Moms? We were looking for a fun meal. On some nights during the summer we do movie nights, game nights or just let’s play nights where we go to a movie downtown near the fountain. This was one of those nights. We wanted something that was quick but reflective of the type of day we were having. I saw a video for this recipe on FaceBook. I changed it up a bit to add additional flavor to the dish. This was fun, tasty and a simple dish that we served with a green salad. The kids thought it was great we were having an appetizer for dinner. Sometimes you must have something fun for dinner and this was great. 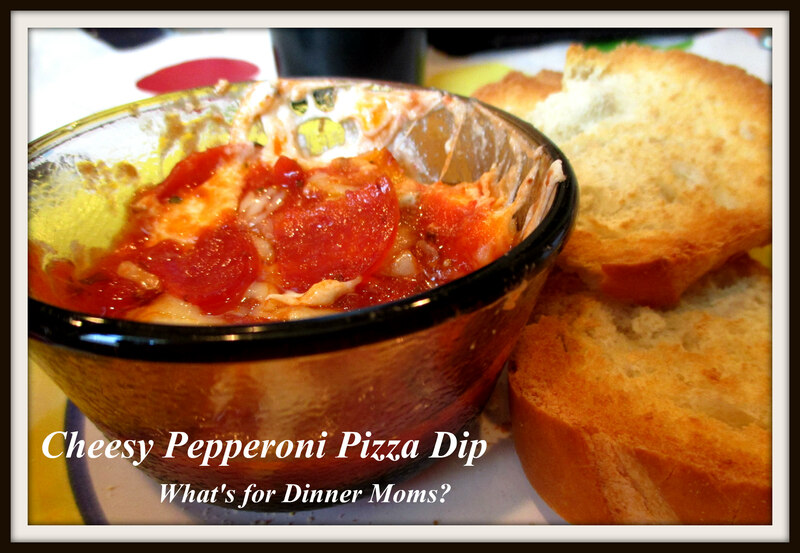 The kids loved the idea of finger food for dinner and it was super easy to make! For my mostly gluten-free son the only change I made was to use a Sharr’s Baguette sliced and toasted for him to eat his dip with. Preheat oven to 375 degrees. Spray a square 8×8 pan with non-stick spray. In a saucepan over medium-high heat stir together milk, Mozzarella cheese and Parmesan cheese until cheese is melted. Add cream cheese and stir until cream cheese is completely melted. Remove pan from heat and pour mixture into prepared pan. Smooth cheese mixture evenly into pan. Stir together pizza sauce and diced pepperoni until thoroughly blended. (TIP: If you wish to cut down on the grease released from the pepperoni as it cooks place the pepperoni on a paper towel and place it in the microwave on full power in 10 second increments until grease is released. Be careful not to burn or over cook the pepperoni,) Pour mixture over cheese in pan and cover cheese completely. Sprinkle remaining Mozzarella and Parmesan cheese over the top of the spaghetti sauce and then top with the sliced pepperoni. If you wish to add additional toppings place them over the top before baking. Bake for 15-20 minutes until brown and bubbly. Allow to cool for 5 minutes before serving. Thank you! Maybe you can share it with your daughter one night and let me know how it is! Thank you. Super simple and very cheesy!